Can you guess what song is now stuck in my head? LAST SUMMER almost 3,000,000 baby trout “rained down” over 662 blue lakes in California’s lofty Sierras. This was not a miracle of nature brought about by the storm clouds hovering over the high peaks. It was a manmade phenomenon, the result of a long experiment in modern trout culture and the planting of fish by airplane. For many years Sierra lakes, barren of fish life, and other lakes heavily fished, were stocked with trout by the use of pack mules, each carrying two 10-gallon cans of baby fish. Many were lost in transport, others injured. The packers had to stop often along the rough trails to replenish the water in the cans and thus provide the necessary oxygen to keep the fish alive. Often there was no trail, even for the sure-footed mules, and the men had to complete the journey carrying the cans upon their backs. Several days were often required for one journey. And the cost was prohibitive, averaging almost $20 per thousand trout. Aerial planting today does the job for $1.25 per thousand fish, and far more can be stocked during the short Sierra summer than could be planted with pack trains. Experimental airplane stocking was first undertaken by the California Department of Fish and Game in 1946, using a small, 165-horsepower monoplane. This was not quite suitable for the job of flying over 14,000-foot peaks, where strong down drafts and sudden air currents whipped through the granite canyons and basins. Would trout live when dropped at the high speed necessary for safe flight? Fish were dropped in five-gallon ice-cream containers, the bottom sealed with wax, and in tin cans with no lids. Fish were dumped directly from the plane. The “free falling” method was found best, in which the fish were “rained down” with the water which carried them. Today trout up to four inches in length can be dropped with 100 percent survival. Those weighing six to eight to the pound show a survival of 85 percent. But larger fish up to 15 inches in length are killed by the impact. The plane in use today is a Beechcraft, powered with two 450-horsepower engines. And chief pilot of the department, Al Reese, whose job is probably one of the most ticklish in peacetime aviation, can whip it down with rare precision over a remote lake for a fish drop. Always a problem in fish transportation is sufficient aeration of the water in the fish cans. In land travel by truck, a small compressor furnishes air, and the same method has been adapted to use in the plane. The fingerling trout are carried in 10-gallon aluminum cans with wide mouths. From eight to fifteen are carried for a fish drop, although more are possible, and 10,000 fingerlings have been dropped at one time. A compressor driven by a 24-volt electric motor supplies air to the cans through a battery of rubber hoses. Another hose aerates the water in the planting hopper. The 50-gallon hopper is made of aluminum and has crimped and welded seams. A rectangular opening cut in the floor of the fuselage, accommodates its bottom flap. This is hinged on the forward side, and is quickly opened by a hand lever operated by the copilot or fish culturist when a drop is to be made. A smaller opening through the floor just back of the hopper provides space for a range finder, which is used by the operator to gain an accurate “sight” on the lake to be planted. A preliminary flight is usually made at high altitude, the plane often rising to 20,-000 feet while the problem is studied. Area maps are of little use in this work, but aerial photographs are useful in pin-pointing many small unnamed lakes not shown on any map. Most of the trout to be planted are produced at the Mt. Whitney State Hatchery at the base of the Sierras. These are trucked to the airstrip in ordinary 10-gallon fish cans and there transferred to the aluminum cans aboard the plane. The cans must be strategically placed in the fuselage for balance and best handling of the plane. So closely does the mighty Sierra wall arise to the west that the pilot must fly back and forth to gain sufficient elevation to clear the peaks, many of them 14,000 feet high. Small lakes are passed over in a few seconds. The correct descent for safety and accurate fish dropping must be gauged as the plane clears jagged peaks and basin walls and slants steeply down to that tiny, blue “dot” below. The operator at the hopper has already poured fish and water from one or more cans into the hopper. As the plane slants down he takes a last, quick sight through the small opening and pulls the release lever. Fish and water are actually sucked from the hopper. The water is at once converted to mist by the propeller wash and resembles a puff of white smoke. But the little trout drop unharmed into their new environment. Only a few fish hit the water head first. The accuracy of this target work is astounding. Al Reese and his assistant can score a bull’s-eye on a tiny lake with a surface area of only two or three acres. Many of these little, blue tarns are surrounded by peaks, and only precise handling of the plane will clear them safely. For some time Al Reese worried over the many tons of water which had to be carried to keep the little fish alive. 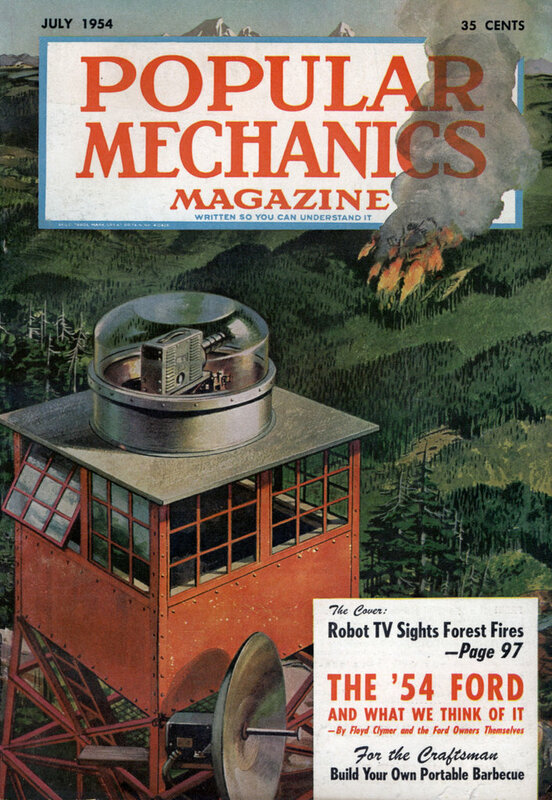 In the 1952 planting he carried a total load of 25,000 gallons of water over the mountains. Could the work be accomplished with less? The answer came with experiments in drugging small trout. Ordinarily the fish are active and alert and use a great deal of oxygen. Experiments showed that sodium Amytal, a barbiturate, would quiet the fish when a half-grain of the drug was added to a gallon of water. Thus only one-third to one-half as much water had to be carried, for the fish enter a state approaching suspended animation. Only 200 trout were formerly carried to a gallon of water. The drug now permits 500 or more to the gallon. Tests proved that the fish were not harmed by the drug and became normally active after the drop. 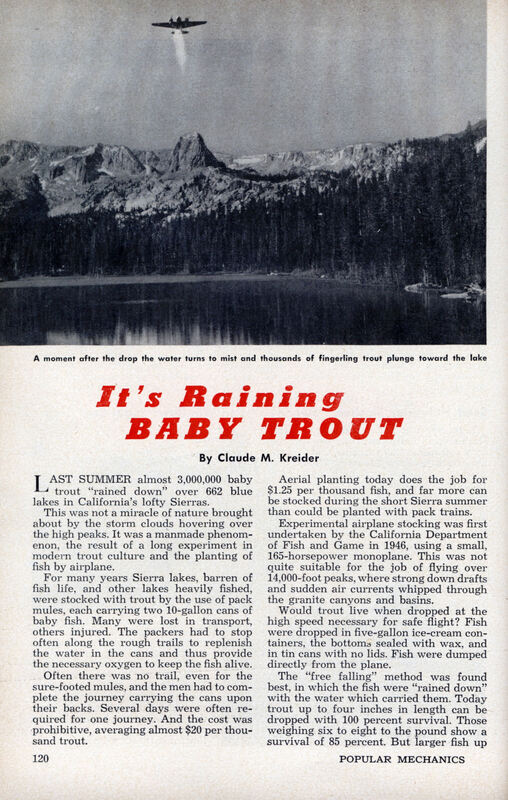 A major operation in 1953 was the stocking of 46 high-altitude lakes with the exotic golden trout, native only to the Sierras and found originally in only one small stream near Mt. Whitney. Landing at the Tunnel airstrip in the mountains, one of the highest landing fields in the nation, trout which had been taken with hook and line were flown down to the hatchery to be used for brood stock. And other goldens, already raised there to fingerling size, were flown back over the peaks to stock the lakes with 200,000 of these rare and beautiful fish. The airplane promises a big future for these beautiful and gamy specimens. They will not retain their bright coloring in low-altitude waters and are best adapted to lakes lying from 10,500 to 13,000 feet. Pack-train transportation to these remote waters is only possible for a scant two months in summer when trails are clear of snow. The plane can drop them early in the season and after autumn snows close the trails. The time saved in aerial planting is enormous. A 40-minute round trip from the hatchery can plant remote lakes, far back in granite-ribbed basins which would take a pack train loaded with fish cans at least two days to reach. Cost of operating the plane is figured at about $32 an hour. The longest haul from take-off point to planting location was 140 miles for the round trip. The highest lake planted was in the Mt. Whitney area, at 13,600 feet, less than 1000 feet below the top of the highest mountain in the United States.